This chart explains what I"m talking about. We typically see multi-year spikes before multi-year quiet periods, and it seems like we're entering the beginning of the next quiet period. 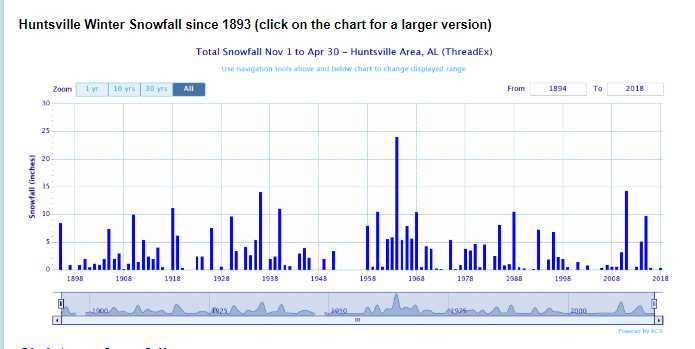 I was born in 1998, so this chart actually perfectly illustrates my claim that I never saw a big snowfall until I was 12. Now, there's nothing preventing it from happening again say maybe NEXT winter or maybe even a late season surprise this winter, but the pattern looking long-term seems to indicate maybe a warmer and stormier February before climatology takes over unless we get another SSW event in the next 30 days. Here is James Spann's mean tweets video. Maybe not the absolute coldest temperatures coming out of this system, but for southern Ontario? This is going to be pretty brutal. The low is gonna be 6F here tomorrow and the wind chills will be well below 0, but I guess I shouldn't complain too awful much. The wind chills in the Dakotas are gonna be around -60F (so roughly the average surface temperature on Mars). I’m just going to be anecdotal but where you see spikes I see randomness not necessarily correlated to colder than average winters although some logically coincide. For example 1988 snow totals include freak April snowfall and the year of superstorm 93 was a March storm following a mild winter. This is from my memory of course not hard data.